Have you ever been to a party and for days it was all you could talk about? There are a few secrets a hostess can use to ensure her guest will be reminiscing about the party for weeks to come. The good news, anyone can be a superb hostess. Follow these steps for an awesome party. A hostess doesn't need to be searching for all the serving spoons or napkins when the guests arrive. Have everything you need in place and ready before the first guest arrives. As the hostess, you want to greet everyone that walks through your door. If your guests have never been to your home before, give a quick tour. Show them where to put their shoes and handbags. While on the tour, show them where the kids can play and where the bathrooms are located. As your guests arrive, introduce them to each other. I know that this is elementary, but take it a step further. When you make introductions, start the conversation with something that your guests have in common. Not everyone is gifted with the art of conversation. This simple introduction will get your guests talking and interacting. Whether you are throwing a birthday party or a dinner party, you need to keep the momentum going. You guests will follow you lead. For example, if you are throwing a birthday party, move from one activity to another. After greeting all the guests, direct them to the snack table. Next play a game followed by the birthday cake. Then play another game. As the party comes to a close, pass out the party favors. This will let the guests know that the party is over and they can leave at their leisure. You don't have to rush the celebration. When you see that your guests are almost done with the snacks, start explaining the game. Lag time is a party killer, and rushing a party sends a bad vibe. 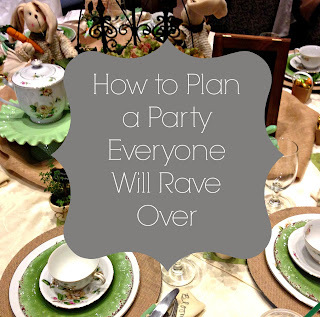 Keep the party going at a steady pace, and your guests will not get bored. As the hostess, you are not the center of attention. Your guest of honor and your guests are to be the main focus. Start the conversations and then let your guests run with it. While everyone is chatting, see if their drinks need a refill or if anyone wants a piece of cake. Let your guests know how much you appreciate their attendance. Give them a party favor or send a thank you note. As they leave, tell them that you are looking forward to the next party and hope they can attend. You will be able to tell if the party goers had a great time. As they leave they will ask to be invited to the next soiree.